After carefully cleaning the dial surface with some distilled water, the radium dust that has been ‘working’ all the time left it’s mark. The surface became a bit dry so I gently oiled the surface with some natural non color containing oil. Witness the stunning result below. A nice and warm tropical brown comes up when you turn the dial into the sun, a brown layer becomes visible…. Next I added a minimum of natural oil to the dry dial and immediately it starts shinning again.. Directly from the original owners family this iconic Rolex Ref 6200 found me. As usual when somebody starts googling around after discovering a potential vintage Rolex treasure, they find my informative RPR website. Not only because I tried to explain a lot about each important Rolex reference but also the reports of the auctions and shows I attent. I always like to explain and help in all necessary details even without knowing if the watch is for sale or not. If it end up with me I think is karma, I can’t change faith.. The naked dial, full of radium that is turned brownish… Below, depends on how you handle it in the sun, the dials color changes as you see below. You see, the dust that comes of the fat applied radium is so aggressive that it “eats up” the lacquer they add to the surface when they finish the dial. To find a fully gloss one that has originally been delivered mid 50-ies and worn, is practically impossible. Why, because during the time it has been worn the radium loosens and then starts to react on the surface. From those that are still 100 % shinny I believe the dial has been: 1) swapped earlier with a spare unused one. 2) professionally restored. 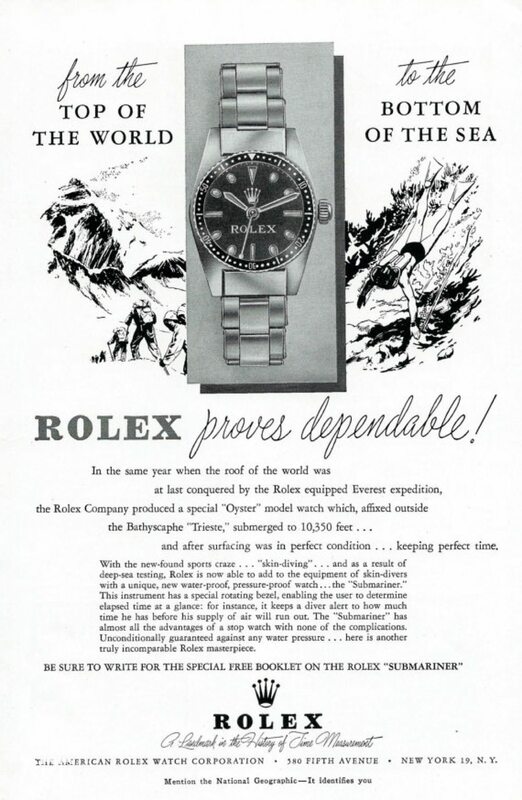 Just after the most important exploration Rolex conquered, the ascent of the Mt Everest with Sir Edmund Hillary & Sherpa Tenzing Norgay and the first deepest dives by Jacques Piccard Rolex understood the (marketing) importance of their “tool – expedition watches”. Up fron again the 3 – 6 – 9 dial with long hour hand and big lollipop secondhand has become a new tropic. We see the ref 6200 without Submariner and with the added Submarine text at 6 o’clock on the dial. Some think, logically, that the later ones are always the ones added with Submariner. 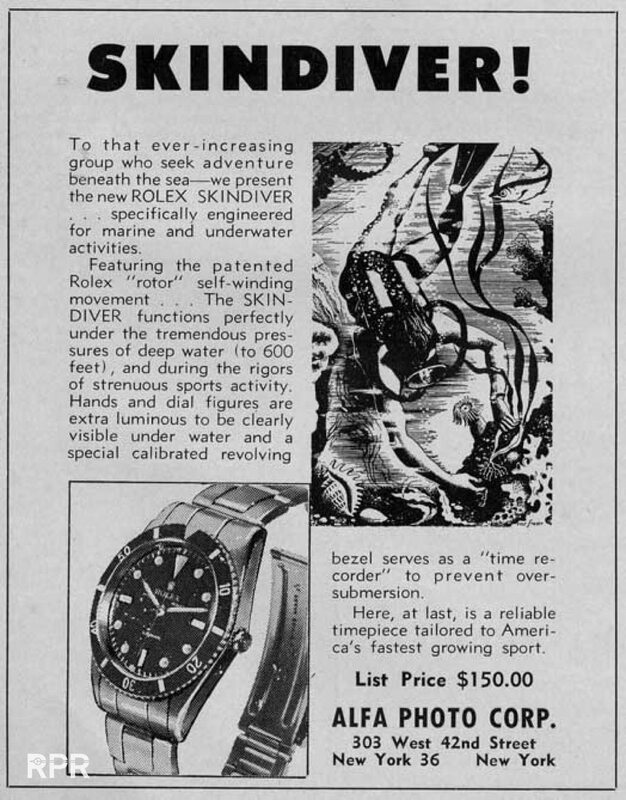 This because the word submariner was still being registered by Rolex in the beginning from 1953 when it was made. Hand Wilsdorf decided not to showcase it in the same year ’53 at Basel but wanted to wait a year and then come with the 200 meter version big crown. 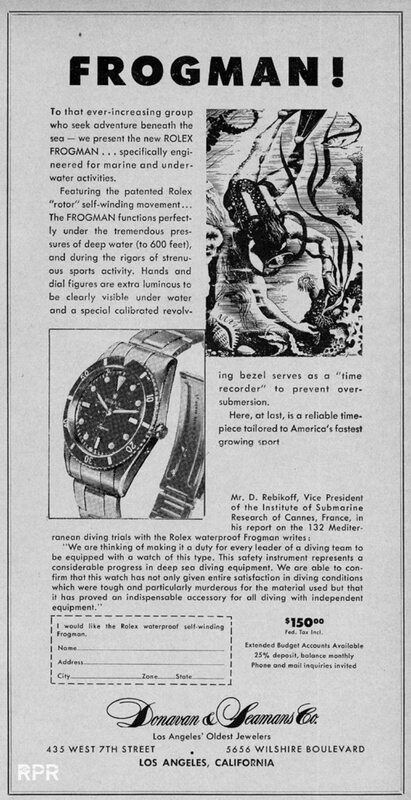 In 1953 he introduced the ref 6204 & 6205, both 100 meter waterproof, what by then already was revolutionary. In 1953 the big brother, the ref 6200 was logically. 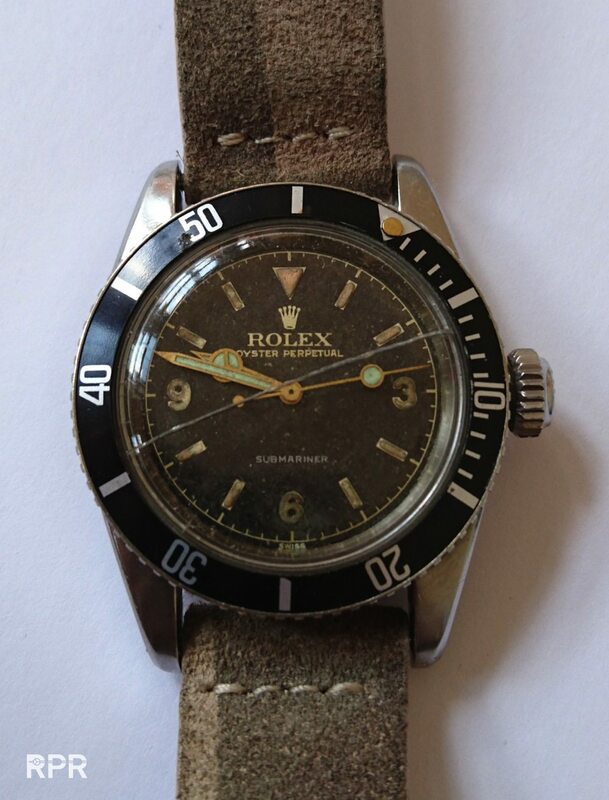 Then in 1954 Rolex started to market their 200 meter waterproof ref 6200 and as most probably the already finished cases where lying in a drawer, the watchmaker just picked one to start assembling. Randomly different cases where taken as they where not stored on serial number. Who really cared back then, the watchmaker for sure not. Then while Rolex decided to pick the by now legendary “Submariner” name for this model, others like Skin-diver & Frogman as you see below, where canceled. 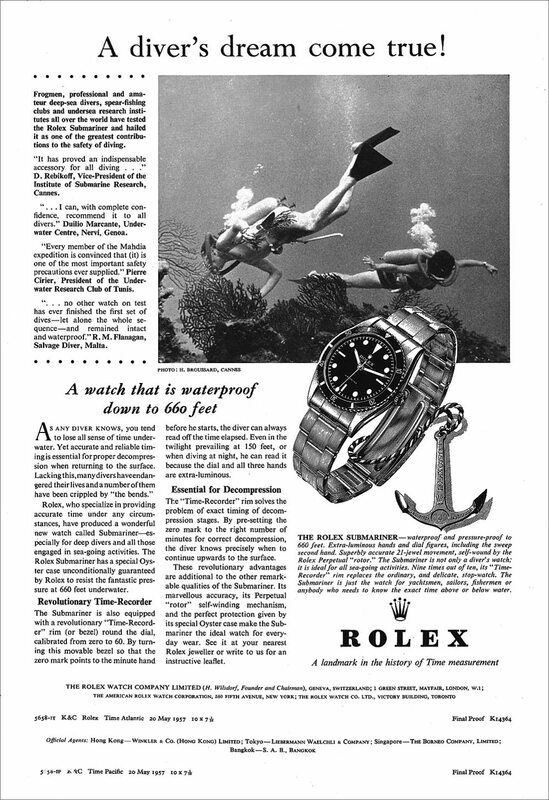 Once Submariner was officially registered by Rolex USA, it got printed on the dial in 1954. This is how it looked when they contacted me…The Ref 6200 has been serviced in it’s life, inside the case back we see 1 mark. During that service the bezel is changed, the crystal cracked recently while cleaning it before this picture was taken I was told. Many thanks again for choosing me as after cleaning it I really started to like it a lot. Whenm you are reading this and you have something familiair in your possession, please contact me over here! I do hope you enjoyed my little report about one of the most iconic Rolex Submariners made. I’m very happy to enjoy it now! This post was written by Philipp on May 27, 2016.